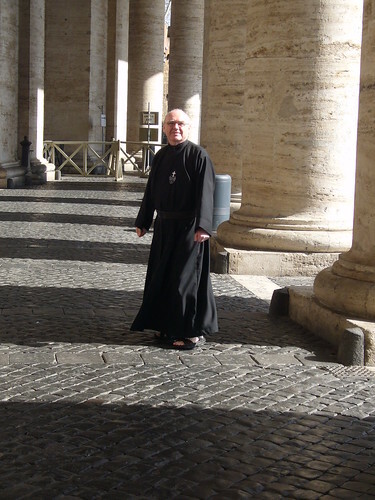 I arrived at Rome Ciampino airport last Thursday night to attend the Consistory for Blessed Charles (Houben) of Mount Argus et alii and was met by Father Mirek, the rector of Saints John and Paul. 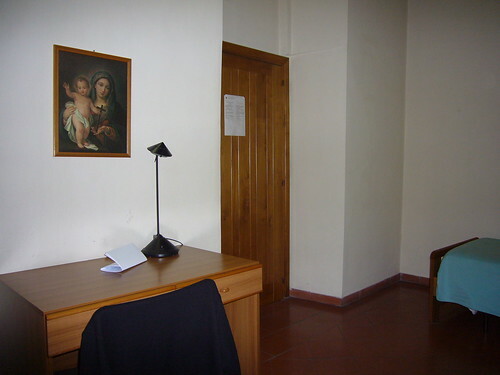 My room this time was in the Reparto Campanile, just beside the bell tower. 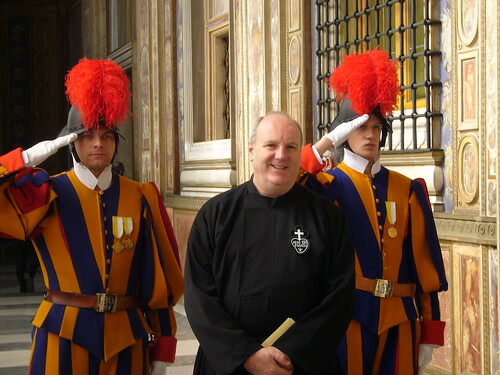 The next morning, we set out for the Vatican to attend the Consistory which was to begin at eleven o’clock. Fortunately I was with some Passionist Vaticanisti, otherwise I probably would have got lost once I went through the Bronze Door. A flight of stairs brought us to the Court of Saint Damasus. 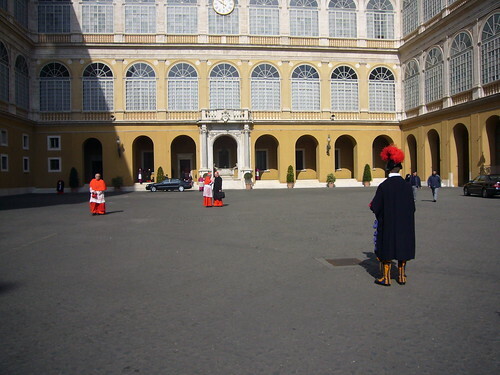 We crossed the courtyard and, after politely stepping back to let some cardinals go first, we entered the building on the other side and took the lift to the second floor. The buttons on the lift were not marked Ground Floor, First Floor, Second Floor, but San Damaso, Prima Loggia, Seconda Loggia. At the end of the long corridor (I should really say Loggia) was the Sala del Concistoro. 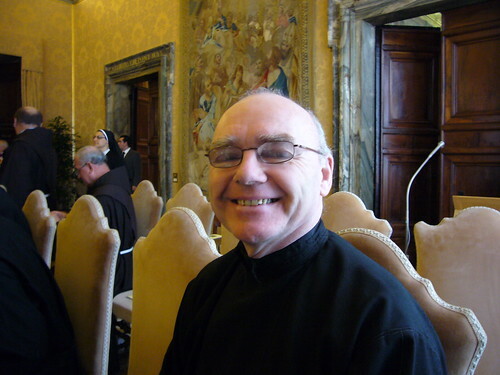 The five future saints were each allowed twelve guests and, in recognition of the humility of Blessed Charles, the Passionists had been given the seats at the back, which meant that we could misbehave in comfort. However, just in case we forgot ourselves and started singing and dancing with joy when the Pope made the announcement, the Postulator General (Father Giovanni Zubiani) came up to remind us where we were. 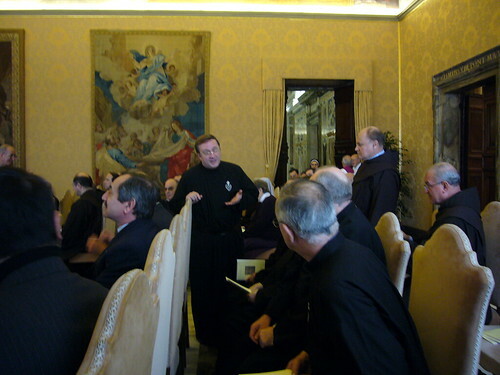 Here are the General Consultors revising Courtesy for Clerics with Father Giovanni. And here is Father Frank Keevins, rector of Mount Argus and vice-postulator of the Cause of Blessed Charles, looking quite chuffed. 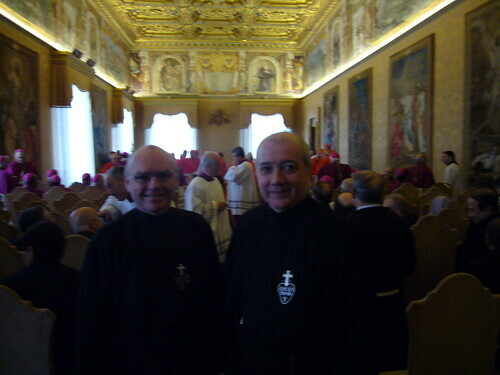 I don’t usually put pictures of me on Laus Crucis, but since I’ll probably never be so high up in the Vatican again (Seconda Loggia), here’s a picture of myself and Father Frank. Sitting in front of us was a group from Malta. 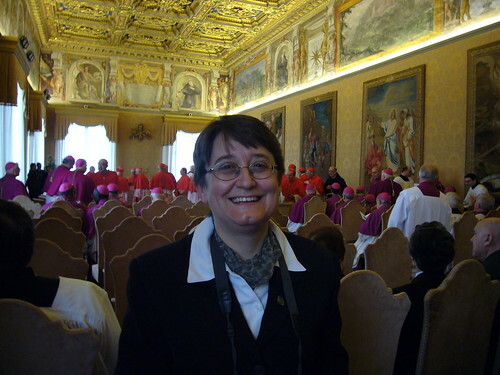 I spoke to the lady in front of me and told her that I had received a comment on this blog from a member of M.U.S.E.U.M., the movement founded by Blessed George Preca; you can imagine my surprise when I discovered that this was the lady who had posted the comment. 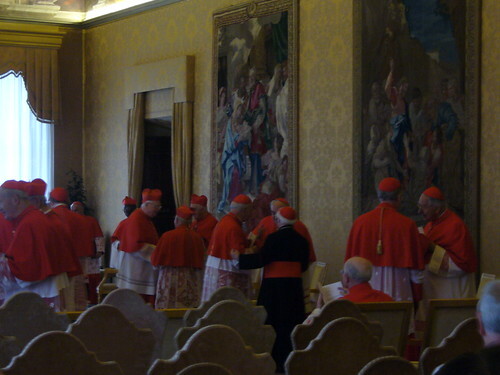 Here are some of the cardinals waiting for the Pope to arrive. 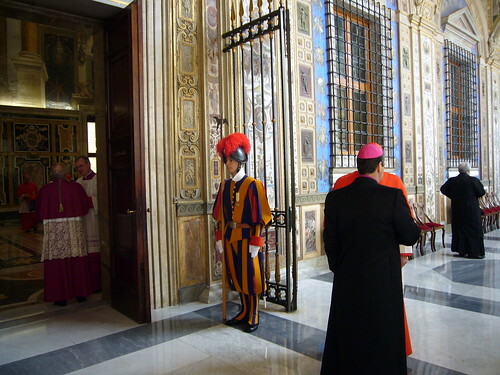 The cardinal in black (with his back to the camera) is the Archbishop of Toledo; Cardinal Arinze is just walking through the door. 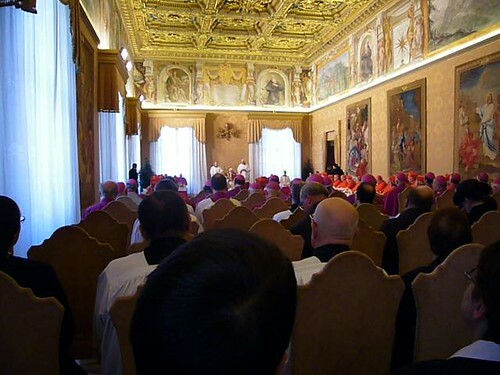 Everyone sat down when it was nearly time for the Pope to come in. 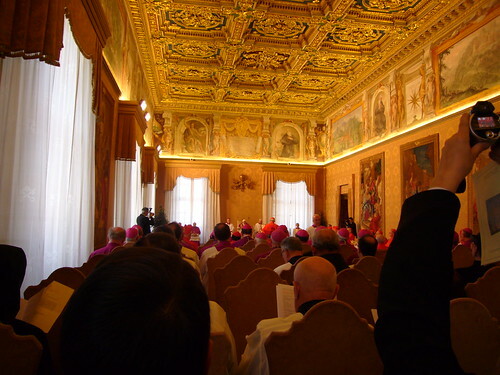 The Consistory began with a celebration of Midday Prayer; the schola and organ were just behind us. 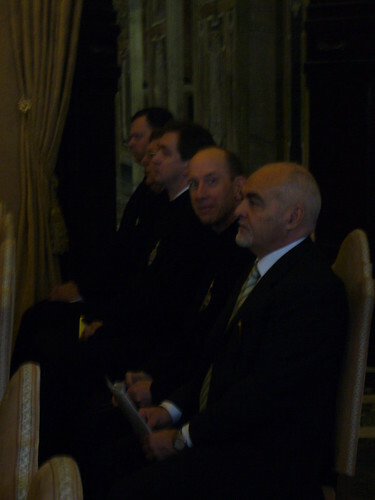 Here is the Holy Father joining in the singing one of the antiphons. 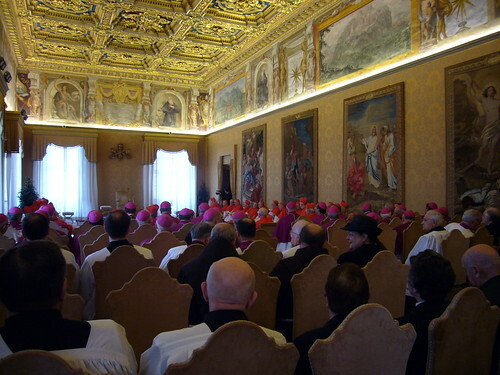 After the Office, the Cardinal Prefect read something about each of those to be canonised and asked the Holy Father to enrol them among the saints. This (and everything else) was done in Latin. 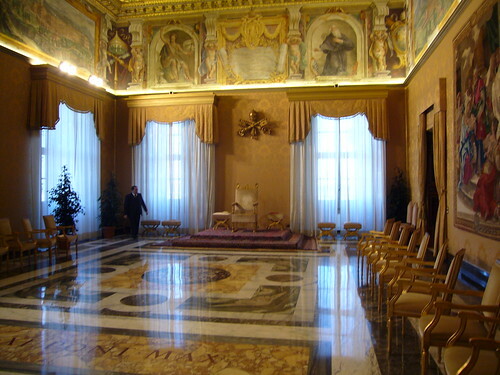 There were some other bits of consistorial business to be done, after which the Holy Father gave his blessing and left. This gave me a chance to take a picture of the room, as everyone else went too. 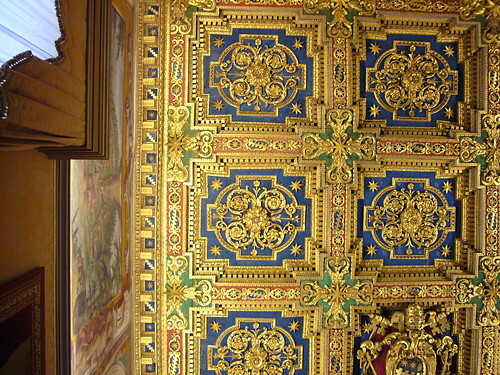 Here is a picture of the ceiling. And here is a picture of the hall taken from outside which shows that, in fact, I wasn’t the last one to leave. 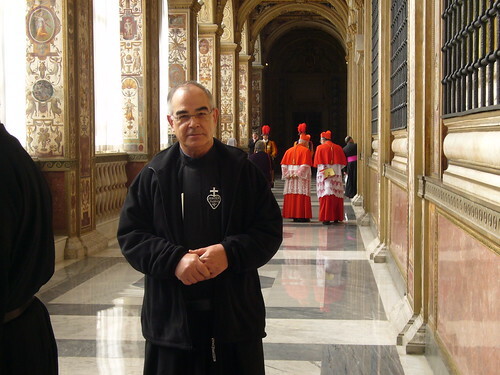 Father Luis Alberto Cano, General Consultor from Spain. 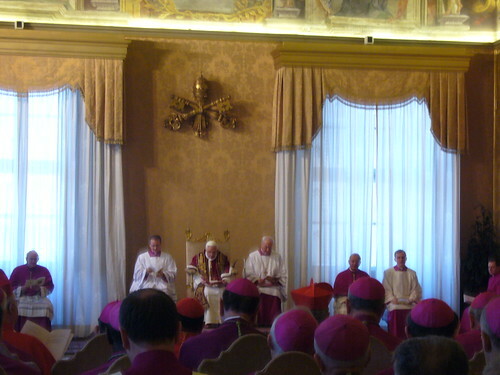 On our way downstairs (quicker than the lift), we almost took a wrong turning but were given directions by Cardinal Re; since he appoints the new bishops, I think we’ve all managed to get struck off that list. 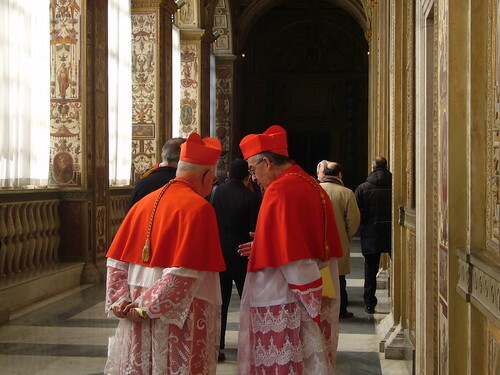 Here he is in the Court of Saint Damasus (he’s the one in red and white in the centre of the picture) talking to another cardinal before going to lunch. 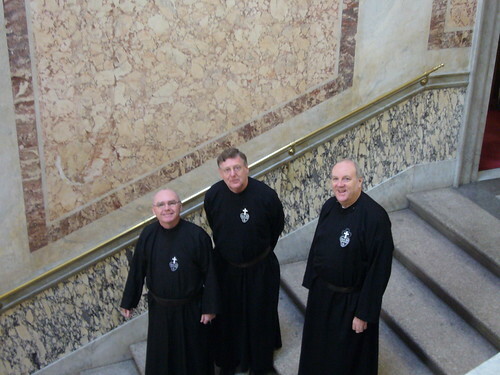 Father Denis was rescued by Father Frank and the Dutch Provincial, Father Leo. Father Frank on his way to phone Mount Argus to tell the community to get moving, as the canonisation will be at the beginning of June and not in October as we had expected. Thanks for some great photographs Fr!